Does Your Digital Marketing Matter? - Wood Street, Inc. Think about that. Marketing today is about being helpful. Unfortunately, heaps of bad ads and useless information in your industry can bury your content. If you’re simply publishing content loaded with keywords hoping you’ll get Google’s attention… STOP IT! You might see some gains in the short term but you’re certainly not going to matter much. The question is, “who matters to you and what do they need?” You have to answer this question before you can produce anything useful. 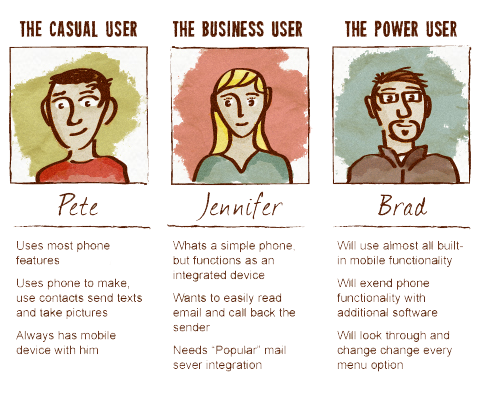 Start with some buyer personas (also know as marketing personas). A buyer person is a character who represents your audience or a subset of that audience. You can use a real person to represent this persona or make one up like you see in the graphic above. What do they need from you? Is it more than one thing? What questions are they asking you? Are there groups for this like associations or councils? What about online communities like a LinkedIn group? Don’t assume, know your audience! Sometimes starting with some anecdotal evidence could point you in the right direction. List 3 things Brad needs from you using real requests, quotes, something that has actually happened. How can you get Brad what he needs on a regular basis? How can you be there in Brad’s time of need? Use real data and anecdotal evidence from real people – the clients you want more of. Develop powerful personas you can target on a regular basis. What’s in it for them? Why would these people want to connect with your organization? Do you have experts offering information your audience can’t easily find elsewhere? Are you providing access to curated content in a way that is unique? Will they find solutions in your content? Is your organization a trusted resource your audience needs? Your organization might not be published (yet) or prolific content creators (yet). But, you have a team that can offer unique perspectives on subjects that no one else can offer! You just need some time to finetune its delivery. This applies to everyone in your firm. Everyone has daily opportunities to be helpful online! This could be with content creation or curation. Or having someone available online through social channels, on-site chats, or in groups and forums. Instead of monitoring for mentions, monitor for opportunities – opportunities to be a hero to your clients (more on this below). To be helpful, you need to be a resource. You want to become the go-to person for information in your industry. The biggest problem with digital marketing today is noise. There is so much crap out there that people struggle to find the quality content they need. Be the person who helps them find it. You can create content that helps make sense of things. And you can curate content that does the same thing. The point is to help people. Are you creating and curating content for your audience? Utility content makes you a hero to your audience! Answer questions, provide guidance, and solve problems. This is what your audience is begging for. For more on this, I recommend reading Youtility by Jay Baer. Are you shouting at people or engaging with them??? Say thanks to those who share your stuff! You’re building relationships here. Content marketing, SEO, reputation building – these things are all part of a long game. Stick to it and remember what Neil says, be helpful! Who are the rock stars in your industry? These are the people that lead the conversation. The experts that your audience looks to for information and guidance. Who are the power players in your industry? Can you engage them directly? How could you build and leverage a relationship with an influencer? I’ll let you in on a little secret, rock stars are just people! They got to where they are by working hard, helping people, and connecting with their influencers. Read their blog posts, comment, share. Read their books, write a review, tell others about it (if you liked the book). After a while you’ll form a real relationship with them to the point where you’re in more of a friend/friend relationship than rock star/fan. Why is this important? Because these people will hopefully start to share your content – but only if it’s useful. What does success look like? Likes, fans and followers are not true indicators. These are vanity numbers. Engagement will produce better results in the long term. Would you rather have 1,000 followers with little to no shares? Or have 250 followers who share your stuff regularly? Engagement builds reach and increases traffic because it validates the value of your content to your audience and to Google! 1,000 followers see your content but no one shares it. You have an audience of no more than 1,000 on that channel. Track, encourage and improve upon activity that leads to traffic, connections, recommendations using the stats available in your social channels as well as Google Analytics or something like it on your website. Stop doing things that don’t matter like buying fans and followers, or advertising on a channel where your buyer personas do not spend time. And if you get no traction with a certain post or topic, take a more critical look at it. Maybe you’re not offering anything new to the conversation. Or your writing is difficult to read or boring (check out the Flesch Reading Ease score). If you’re not certain, ask a trusted client or advisor for feedback. It’s not about the tools! It’s the people, man. Tools can’t build a car and roads are useless without traffic. Digital marketing is about people, engagement, and measurable outcomes. Channels will change! Make connections where the audience is. But, keep yourself on solid footing. Build a homebase for all your marketing efforts, a solid, easy to use website where great information is abundant and easy to find.